In the months leading up to the World Cup, this mouth-watering fixture was always talked about. Everyone wished that these two arch rivals pit their cricketing wits against each other. And Ravi Shastri secretly hoped that he could use the phrase "Mother of All Games" in this world cup. Well, he wasn't disappointed. Now, whenever there is a match of such epic proportions, it is human attitude to dust the old books and come up with mind-boggling statistics. The stats-gurus dig in so deep and try so hard to give us irrelevant statistics like: "Whenever Laxman Sivaramakrishnan commentates, Sehwag gets out" or "Whenever Navjot Sidhu wears a purple turban (and a green tie), it is a good omen for Sachin". Good omen for Sachin might not be the same for millions watching those hideous colors on TV. All said and done, statistics are really interesting and always make up for a nice read. Here is a detailed analysis of India-Pakistan clashes in all forms of cricket. And yes, that includes Gilli-danda, French Cricket, Book Cricket and Hand Cricket. Gilli-Danda is, and I quote Ravi Shastri, the "Mother of All Forms of Cricket". Technically, there has never been a Gilli-Danda World Cup as the Aussies refused to play a sport without any balls. Hence, it was an informal tournament between Indian and Pakistan just after the independence. The match was supposed to be played within the spirit of the game but hell broke loose when Aamir Sohail's grandfather disrespectfully asked Venkatesh Prasad's grandfather to fetch the Gilli. That was the last time a Gilli-Danda match between Indian and Pakistan took place. This informal,rather complicated, version of cricket is the only form that hasn't been mastered by the teams from the sub-continent. The number of runs scored is equal to the number of times one revolves the bat around his hips until the ball is touched by the fielder. Big name players such as Inzamam Ul-Haq, Ramesh Powar aren't particularly huge fans of the game. India-Pakistan match was the dullest affair that took place in the tournament in France and both teams were disqualified for their "mischievous banter" about the game. However, few Indians and Pakistanis are members of the elite group with strike rate below 100( in French Cricket, a strike rate below 100 is considered to be very rare and very unimpressive). This form of cricket has had so many World Cups at so many venues and yet, the lack of media coverage still haunts this sport. The following statistics will concentrate on a particular small time school in Dubai called as Our Own English High School,Dubai. The major World Cups take place daily in the classrooms of VIII 'A' and VIII 'B'. Despite being one of the simplest forms of cricket, book cricket has had its own share of controversy. The Indians wanted to use a huge book by R.D.Sharma while the Pakistanis wanted to use a book that had page numbers in Urdu to confuse the Indians. After several debates, Lord of the Rings was chosen as the book but was discarded due to the hardly visible page numbers it had. At present, players generally use any book that they can catch hold of during the match. The head to head record of India-Pakistan encounters is not available due to improper documentation and contempt shown by the media. However, here is a pie-chart showing some grueling statistics about book cricket. 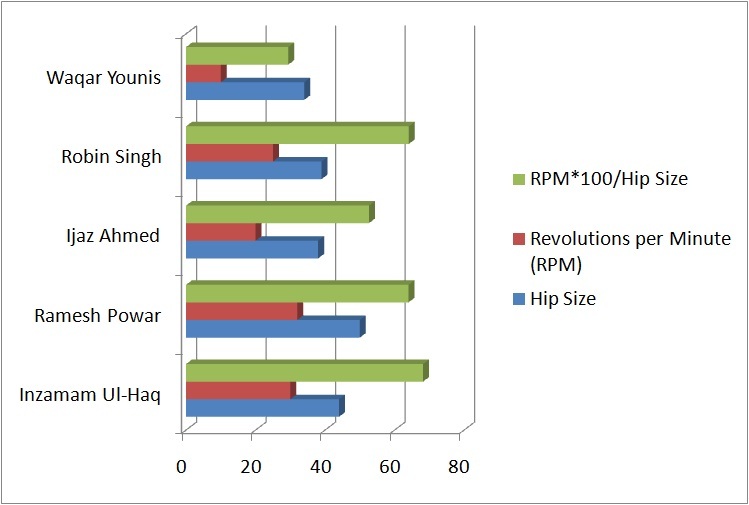 Pakistan might hold an edge over India according to this data. Indians tend to be over enthusiastic and take the Glossary page quite often. This form of cricket should not be confused with Oongli cricket, a corruption of Hand Cricket by Idea. 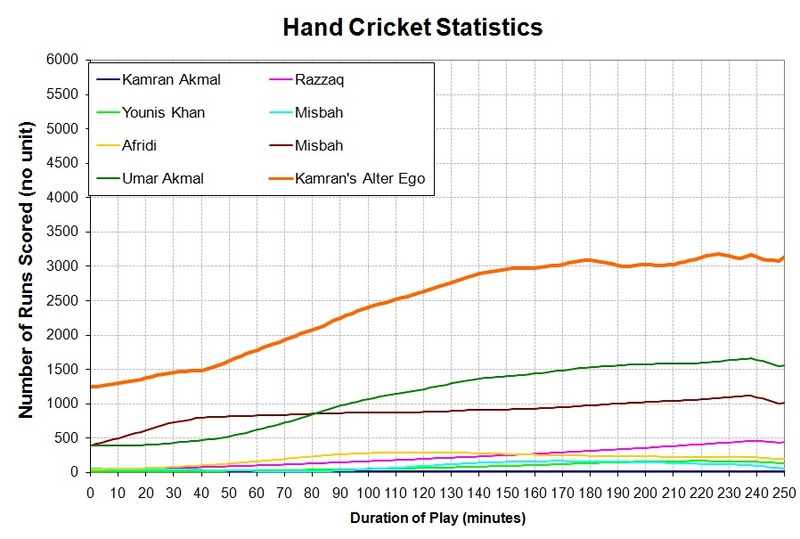 Hand Cricket has had its own ups and downs and the Pakistanis are responsible for the the downs. Pakistan has never lost a single match in Hand Cricket thanks to their flamboyant player's six-fingered alter ego. Yes, Kamran Akmal is a formidable player in this form of cricket and has never gotten out. 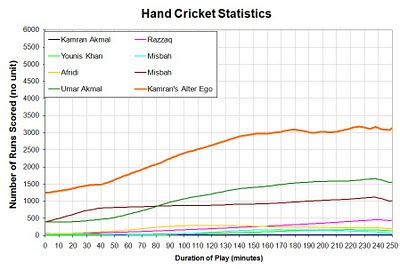 All nations have withdrawn from IHCC (International Hand Cricket Council) until Kamran retires. Looks like Pakistan has the better record over India in these forms of cricket. But the Indians are not impressed by statistics and they don't care about history either. " Well of course, at the end of the day, it is important how we play our cricket on the day" said a very confident M.S. Dhoni. Let us hope he plays the right people for the match and then play the right cricket to win the match. PS: For a less detailed but reasonable analysis , please read this. @Morpheous with so many special characters: Ugly or Bad = Moka. But when in doubt go for Ugly. @Johndoe : Ok ok..cool down cool down.